The Bundesbank this week issued an exhaustive list of every last of the 270,316 gold bars it has stored in vaults around the world on behalf of the German nation. The 2,300-page document revealed the detail and location of each of the bars, together containing 3,384,227.7893 kilograms or 108,805,421.213 troy ounces of gold worth just under $126 billion at today's price. 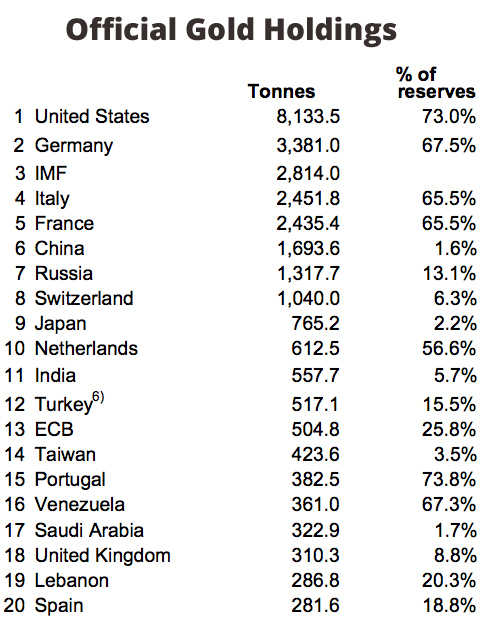 That place the European country second only to the US in terms of its official gold reserves. The central bank also said it will be updating the list on an annual basis henceforth. While the information may assuage some of the bank's critics who've been skeptical of the existence of the bullion, those campaigning for the repatriation of Germany's gold from vaults in the US, England and France will see little progress has been made in this regard. In January 2013 Germany's central bank, the Bundesbank, said it will ship back home all 374 tonnes it had stored with the Banque de France in Paris, as well as 300 tonnes held in Manhattan by the US Federal Reserve, by 2020. 33 months later and Buba, as the Federal Bank of Germany is often called, is not very far down this road. Paris still holds 308 tonnes, the 439 tonnes of bullion held by the Bank of England is staying put and the Fed is still sitting on 1,451 tonnes or 43% of the total. In May 2013 year Austria, perhaps unnerved by Germany's experience with their bullion and mindful of Brown's Bottom, sent a team of auditors to check on gold held by the Bank of England. Only 17% of Austria's 280 tonnes of gold reserves are held inside the European nation with the Bank of England holding the bulk or some 150 tonnes worth more than $6.2 billion. Other nations have been more successful in their repatriation efforts. In November last year, the Dutch central bank has secretly brought 120 tonnes of gold, valued at nearly $5 billion, of the European nation's gold reserves held in New York back to Amsterdam. In November 2011, Venezuela repatriated some 180 tonnes of gold held in vaults in London and elsewhere to store it with the Caracas central bank under orders from late President Hugo Chavez.